Following are issues that may occur when importing content into Flare. Topics imported into Flare do not have a scroll bar when generated with the rest of the project. Consequently, all content after the first screen is not viewable. This is the result of a change in the stylesheet's html and/or body styles during the importing process. From the Content Explorer, open the stylesheet that you want to modify. Warning: When editing styles, make sure the proper medium is selected in the Stylesheet Editor before you begin (you can do this from the Medium drop-down list). Flare remembers the last medium that you used when working in the stylesheet, so it may or may not be the one that you want to use the next time around. If you want all mediums to use the same setting, select the "default" medium and the properties will "trickle down" to the other mediums. If you are not using different mediums, you do not need to worry about selecting one when you edit styles. See About Mediums and Media Queries. In the local toolbar, make sure the first button displays . If the button displays instead, then click it. In the upper-left corner of the editor, click in the Show Styles field and select . From the Show drop-down list on the upper-right side of the editor, select . (Optional) You can use the toggle button in the local toolbar to show properties below in a group view or an alphabetical view . If you are using the group view, expand the Positioning group. To the right of overflow, click and select default. Repeat steps 5 through 7 for the body style. 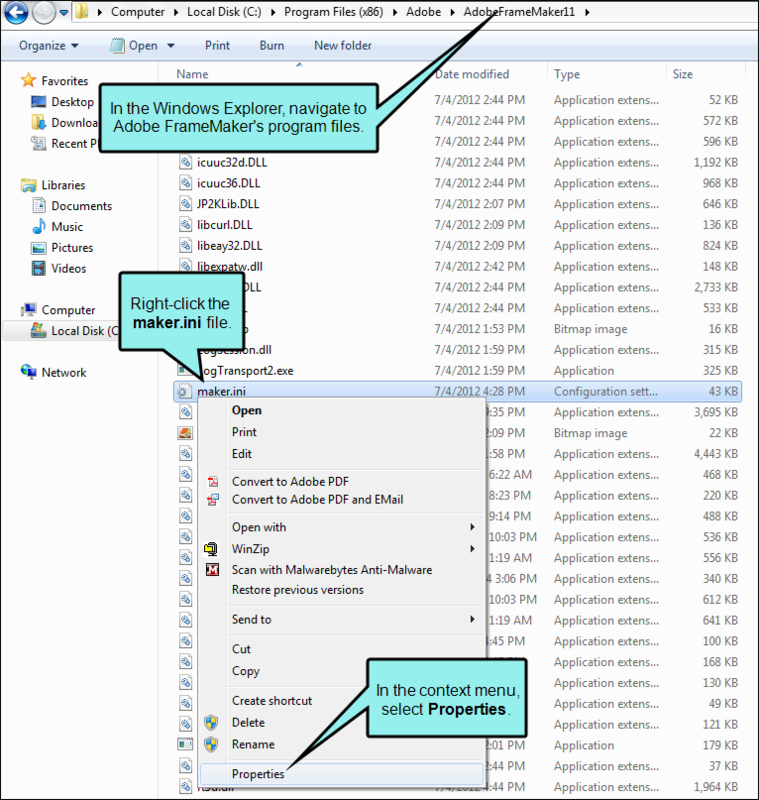 "Failed to run command 'Add FrameMaker Import File …'"
Failure to import Adobe FrameMaker files into Flare might be a result of Windows 7 and its use of User Account Control (UAC). If this is the case, performing the following steps allows Flare to write to the file. Locate the maker.ini file (its location is listed on the message). For example, from the error shown above, you would use the Windows Explorer to navigate to C:\Program Files(x86)\Adobe FrameMaker 7.2\. 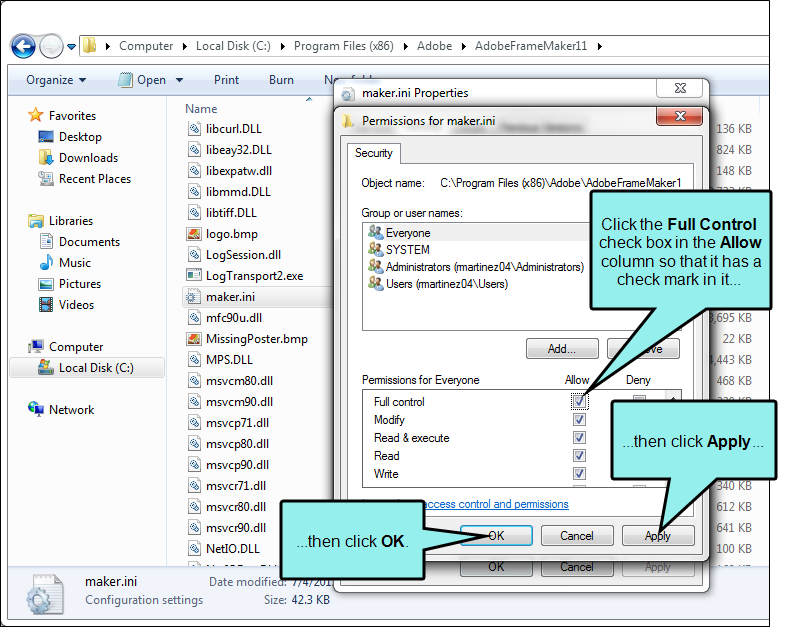 Right-click on the file called "maker.ini" and from the context menu, select Properties. The Permissions for maker.ini dialog opens. Select your Windows log-in user name. Make sure that the Full Control box is checked. Click OK to exit the Properties dialog. You should now be able to import successfully. If you select a medium in the Import Styles dialog, the preview window displays all the styles in the stylesheet you have selected even if the style does not exist in the medium you have selected. If you select a style in this case, the style will not be imported because it does not exist for that medium. This is an issue in Flare that will be addressed in a future version. In the Import Styles dialog's Medium field, select the default medium. Select the styles you want to import. Click OK. Selecting this medium imports the medium associated with the style you have selected and prevent you from selecting a medium for which the style is not written. Select the style you want to import (e.g., the p class for all paragraph styles) and import all styles in that class. Click OK. This will import all the styles and all the mediums in that class, so there will be no conflict over styles that do not exist in a specific medium. For more information, see About Mediums and Media Queries and Importing Styles. The reason for this problem is that Microsoft Visio fails to write the style correctly, causing the arrowheads on lines to disappear. To solve this problem, perform the following steps. Open the SVG file in Notepad. In the Find field, enter the following. In the Replace field, enter the following. Open the file in a web browser to verify the arrowheads are now part of the image. Import the image into Flare. The document can not be imported to Flare unless Microsoft Word can save the file in XML format. This error can have the following causes. This error appears because the Microsoft Word document being imported has its attribute set to "Read-only". Flare cannot save a Microsoft Word document in XML format when its attribute is set to "Read-only", and therefore cannot import it into a project. Set the attribute of the Microsoft Word document being imported to "Read-only". Perform the following steps. 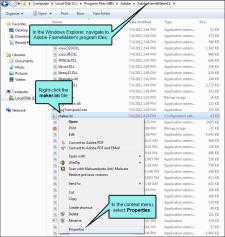 In the Windows Explorer, navigate to the location of the Microsoft Word file that you want to import into Flare. 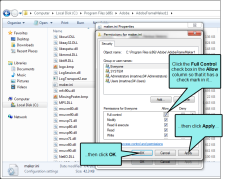 Right-click the file and from the context menu, select Properties. In the Attributes section, click the Read-only check box so that it is unchecked. Import the Microsoft Word document into Flare. The error will not appear. The macros set in the Microsoft Word document are causing problems with the import process. Disable the macros in the Microsoft Word document. The document needs to be converted to XML format. Save the document as an XML document, then save it again as a Microsoft Word document. In Microsoft Word, select File > Save As. In the Save as type field, select Word XML Document. 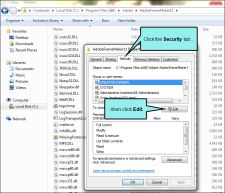 Repeat steps 1 through 3, but in the Save as type field, select Word Document. Open Flare and import the Microsoft Word document. The error should not appear. For more information see Importing Word Files. If you apply certain special effects or artwork (e.g., arrows) to images in Word and then import them into Flare, those effects will not be retained. For example, a rotated image will return to its straight, original state. However, there are some workarounds (listed below) that may allow you to keep the effects or artwork. As for text floating around images, this effect is not supported in Flare. When you import from Word, the text is added below the image. Apply another effect such as a shadow or 3-D to the image in Word (e.g., add a shadow to a rotated image that you want to keep). This forces Word to save the image as an entirely new image with the effects. Save the Word document as a web page (HTML file). 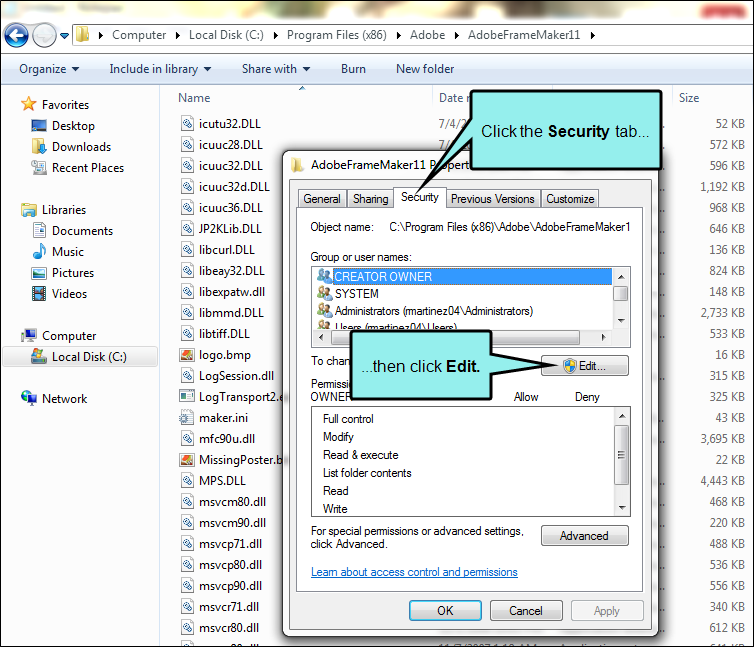 Manually copy that HTM file into the Flare folder.